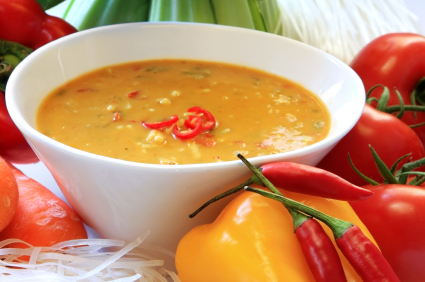 Traditional laksa recipes are usually made with coconut milk which is high in saturated fat and kilojoules. Swapping the coconut milk for coconut flavoured evaporated milk is a clever way of lowering the saturated fat and kilojoule content, without comprising on taste! Heat oil in a large saucepan. Add laksa paste and chicken to the pan and gently cook, stirring until chicken is firm. Add the canned soup and 2 cups of hot water to the saucepan. Stir through and bring to the boil. Soak noodles in hot water until they are soft and transparent. Drain and cut into small pieces. Add frozen vegetables and cooked noodles to the laksa mixture. Stir well and simmer on low heat for 5 minutes. Stir in the coconut flavoured evaporated milk, heat through and serve. Make a vegetarian laksa by replacing the chicken with 300g of firm tofu. You can make your own coconut flavoured evaporated milk by adding 1 teaspoon coconut essence to 1 can of reduced fat evaporated milk.